Aerosmith are using to hanging with legends, but this one was local and personal. AeroForceOne reports the bad boys from Boston had a visit from one of the most prestigious trophies in all of sports, the NHL’s Stanley Cup, at their Massachusetts studio, Pandora's Box, on Friday. 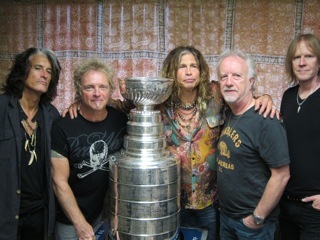 The band's producer, Jack Douglas, arranged to have the Cup there with some of the Bruins training staff. The boys took about an hour off from recording while they posed for pictures with Lord Stanley's bowl. Back in 2003, Boston native Jay Pandolfo of the champion New Jersey Devils brought the Cup to the same studio when the band was recording "Honkin' On Bobo" with Jack. That was sweet, but this is much sweeter since it was the hometown Bruins who won it this time as they defeated the Vancouver Canucks last month in the battle for hockey’s ultimate prize. Steven Tyler sang the national anthem at the Bruins’ home opener last October, and the band regularly supports the team and its charities.